Back in the day, as they say, Vermont was home to some of the most fertile farmland in the country. If you want to hear about it until the cows come home, we’ve got the place for you. Billings Farm and Museum is one of the oldest and finest working dairy farms in America, housing Jersey cows, draft horses, Southdown sheep, oxen, chickens and more. For a taste of life on the farm, including the sweet milk and butter it yields, head to Woodstock, VT. The farm was established in 1871 by Frederick Billings, a native Vermont lawyer and conservationist turned unlikely farmer, who became a pioneer of scientific farming through his careful record-keeping and selective breeding. The historic farm saw decades of successful operations (and champion cows) before turning its mission to education. When you visit, you’ll experience rural life of then and now, as the century-old farmhouse transports you to the 1900s and the afternoon milking snaps you right back into reality. The farm is also host to an annual calendar of festive events, like May’s Cheese & Dairy Celebration, the Old Vermont 4th every Independence Day, autumn’s Annual Quilt Celebration and Christmas at the Farm, just a few of Plump’s favorites. The daily milking of the herd at 3:15 p.m. (sharp) doesn’t hurt, either. 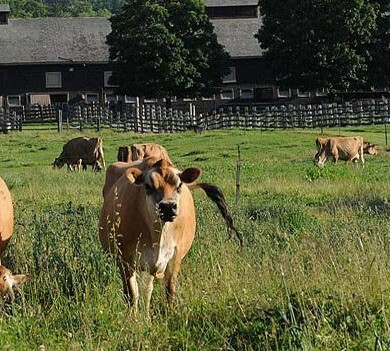 If you’ve never witnessed the grit and glory of life on a working dairy farm, head to Billings Farm and Museum, located at 69 Old River Road in Woodstock, VT. For more information, visit the Billings Farm and Museum website or call (802) 457-2355.